With the introduction of the Affordable Care Act, millions of Americans suddenly had new options for health insurance coverage that was once out of their budget or denied to them based on a pre-existing condition. Yet even the best health insurance plans can’t cover every single cost related to a hospital stay, and almost every plan includes at least a few exclusions and coverage limits. And don’t forget about deductibles, the amount of money you’re expected to pay before your insurance company starts picking up the bills. Reasonable hospital costs would make this a minor inconvenience, but today’s hospital bills are far from reasonable. These five astronomically expensive hospital stays will convince you to take out a hospital indemnity plan, a secondary form of insurance that provides fixed reimbursements based on the length of stay. It’s been impossible to verify, but it’s widely believed that the $9.2 million bill generated by a patient at Tampa General Hospital is the largest, at least in the U.S. A woman known as Mrs. Campbell checked into the hospital for complications due to a non-curable disease that causes the immune system to attack the nerves of the body. She stayed in the hospital until her death, and now the hospital is seeking nearly $10 million in compensation for her end of life care. Her mother claims that the charge is only that high because she was preparing to file a counter-suit of malpractice due to underfeeding and excessive dosage of morphine. It’s unclear if any of the costs are covered by any health insurance plans, but the patient’s family is now being sued for the total. Of course, it was likely that Mrs. Campbell stayed for months or even years in the hospital. But high bills can still come from much shorter stays. A pediatric patient requiring gastric surgery and a one-month recovery stay managed to rack up around $1.2 million dollars in charges. A large part of those charges came from the simple administration of nitrous oxide, a very widely available gas, to prevent pulmonary hypertension during recovery. The gas treatment alone accounted for $40,000 per day during the hospital stay. You definitely need both strong health insurance plans and a large hospital indemnity policy to cover that kind of expense. Aside from individual stories of outrageous bills, there are certain procedures known to cost far more than any other that require a hospital stay. According to the latest data, an intestinal transplant is considered the most expensive single hospital procedure. It’s a very complex surgery, and once you add in a lengthy recovery time, you can expect to owe the hospital at least $1.2 million. Make sure when you compare health insurance plans to check on how each policy handles transplants. They may be life-saving, but they’re among the most expensive medical procedures. All of the bills above were technically correct, but some of the scariest hospital costs arise from a simple billing error. A New York man went to the ER for pneumonia and happily recovered—until he received a bill claiming he owed the hospital $44 million dollars. The error was settled and he ended up spending only $300. Still, he would’ve spent nothing after receiving compensation from a hospital indemnity plan. 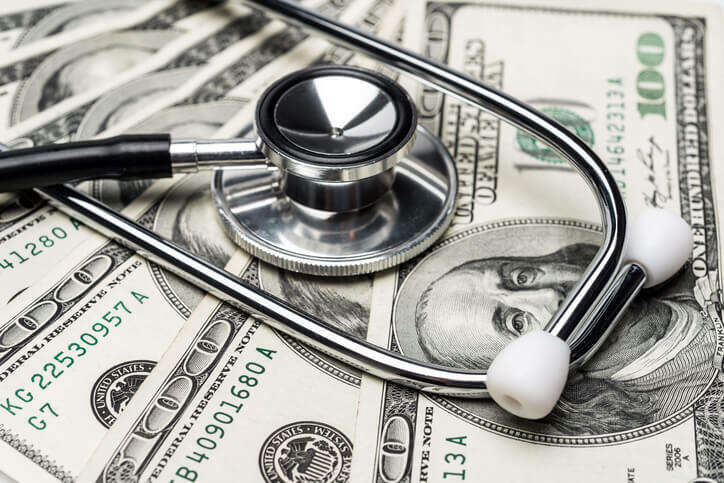 Finally, it pays to request an itemized bill and pay attention to the charges even when you have both health and hospital indemnity insurance. A man was billed for $14,000 after a doctor put a few stitches on his cut finger. The bill claimed he received tendon repair, a procedure his doctor specifically said was not necessary, and a skin graft. Even after negotiations, his insurance paid for procedures he claimed were never done. Tired of shopping for online insurance? Deal with a licensed and experienced insurance agent face to face by visiting one of our convenient Freeway Insurance locations today. You can also request a free health insurance quote online or call us at (800) 777-5620.